See, Superman has limits. Once he hits that 23rd story, he also hits wall. Usually a list of pencilers that long in a twenty-two page comic would have me asking questions, but this issue is a special case. As a reader I was waiting to get to this one as it’s one of my favorite issues not only of this title but Superman in general. As a reviewer it’s a whole other story. Twenty-two of them to be exact. 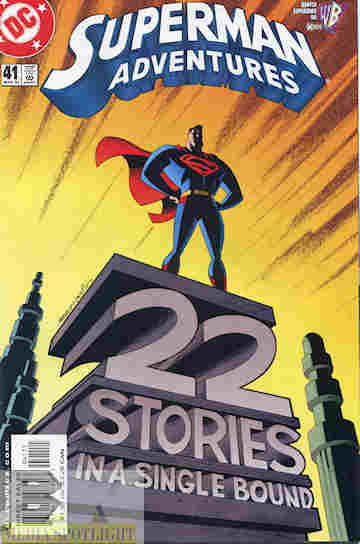 You see, instead of one twenty-two page story this issue has twenty-two one-page stories. And that’s why I like it. While most of them focus on the Man Of Steel himself, others focus on Lois, Lex, Maggie, Supergirl, Mr. Mxyzptlk (who shows up multiple times for every ninety days he gets an opening), and Jimmy among others. Some stories focus on Superman (or the other characters) in action and some are about Superman’s influence on others, positive and negative. Each of them are fun to read. My favorites include Dr. Hamilton performing an experiment that isn’t what it seems, Lois having Superman save her every day of a week except one and having to save herself (and complaining nobody’s around when she needs them), and Mxyzptlk being chased off by Batman. However, all of them are fun short stories with Superman and cast. This is a must-own issue for Superman fans, especially if you liked the DCAU series or don’t follow main continuity but still like Superman and his friends. Posted by ShadowWing Tronix on December 22, 2018 in Animation Spotlight, DC Spotlight, Television Spotlight, Yesterday's Comics and tagged DC animated universe, DC Comics, DCAU, Superman.